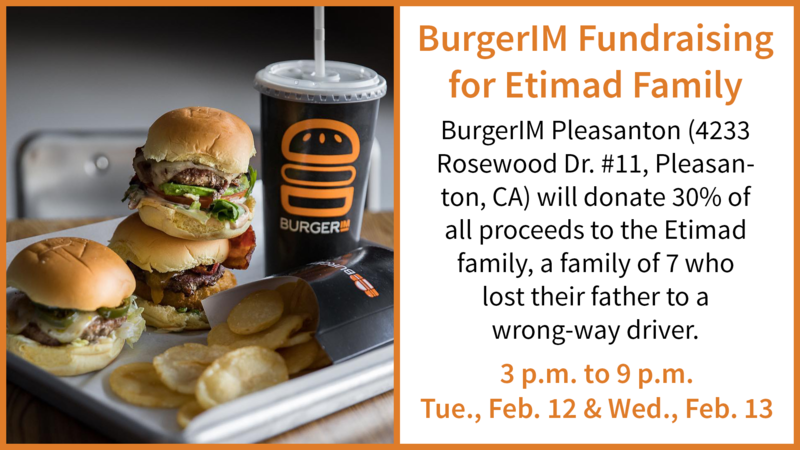 BurgerIM Pleasanton (4233 Rosewood Dr #11) will donate 30 percent of all proceeds from 3 p.m. to 9 p.m. on Tues., Feb. 12 and Wed., Feb. 13. to the Etimad family, a family of 7 who lost their father to a wrong-way driver. BurgerIM is also providing one year free meals for this family delivered at their home. The BurgerIM Pleasant Hill (2380 Monument Blvd C-2) will also do the same from the same timings on Tues., Feb. 19 & Wed., Feb. 20. The owners of BergerIM – MCC congregation members Leeza & Abdul Popal – also own Midas Dublin, which donated all repairs on the replacement van that was donated to the Etimad family this past Sunday.